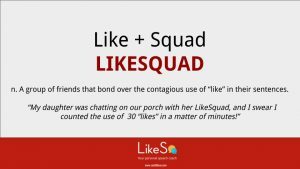 Who is, Like, in Your LikeSquad? The way we speak is contagious and a tribal form of bonding (like, ya know, totally!). We are all so busy wanting to be part of the tribe that we don’t realize how habitual verbal crutches become – how they take over our speech and the way we present ourselves. It appears that the mindless repetition of filler words has not only become more pervasive but is now a verbal fashion trend. When you are with your friends, do you find yourself bonding over saying words like “like” all the time? What is this group called? Ever since I had the epiphany that the use of filler words are at epidemic proportions, and that an app could help us all be better speakers, I have been frustrated by the lack of words to describe this pervasive phenomenon. I needed better words to describe the excessive use of needless words that are undermining our speech. And thus, The Verbal Habitionary (verbal habit + dictionary) was born. The Verbal Habitionary offers portmanteau words (a blend of words) to give us all the vocabulary to talk about – and find solutions to – this increasingly ubiquitous habit that is undermining our communication, watering down our meaning, and distracting our listeners. adjective. 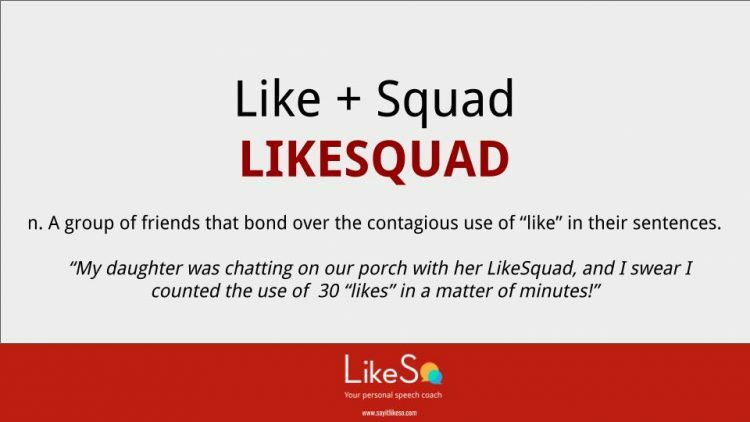 A group of friends that bond over the contagious use of “like” in their sentences. Use it in a sentence, you say? Look out for new entries in The Verbal Habitionary, and please send along your own words and ideas!